Dr. Parsa Mohebi now announces the expansion of the use of the Mohebi Inserter to assist in making the placement of hair follicles easier during a hair transplant procedure. The Mohebi Inserter makes the overall surgical experience safer for patients and helps them take a giant step forward in achieving the hairline of their dreams. Dr. Parsa Mohebi, the founder of Los Angeles-based Parsa Mohebi Hair Restoration, announces the expansion of the use by his practice of the Mohebi Inserter. When asked why the inserter is so popular with his patients, Dr. Mohebi replied “The inserter greatly reduces the outside forces that can cause an injury to the bulb of the hair follicles. 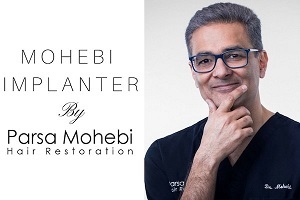 Dr. Mohebi, the creator of the Mohebi Inserter, shared the “Mohebi Inserter contains a blunt tip that aids in the hair follicular graft placement process. Dr. Mohebi stated “the Mohebi Inserter is a big step forward in increasing the comfort of patients during surgery while also making the process more efficient.